As many of us in the DC area are on the move a lot, Monday Night Meditation is a drop-in gathering and you are welcome anytime. Feel free to come early, relax and enjoy some quiet time before we begin. If you’d like to support your meditation practice on Monday nights at the Unitarian Universalist Church in Arlington, please consider coming an hour earlier to enjoy a Mindful Movement class. The class offers a form of movement that is particularly well-suited for meditation. You’ll explore practices that will energize and strengthen you, help you release deep-seated tension and cultivate a sense of presence and well-being. The class is designed to be inclusive for all levels of yoga, from new to experienced. Class begins as 6:30 and ends at 7:20, giving you time to gently transition to the guided meditation with Jonathan at 7:30. This class is offered freely so that no one is denied access to the practices. Your donation helps cover the cost of the room and supports the teacher. Rita Naomi Moran was first initiated into meditation practice at the age of 6 with Transcendental Meditation. Since then she has traveled extensively, in the US and abroad, to study meditation and yoga. As a physical therapist and yoga teacher, she has a passion for helping people to integrate healthy movement and spiritual practice into every day life. Currently she is finishing her 500 hour yoga teacher training at Kripalu as well as a certification in women's health physical therapy with a specialization in pelvic floor issues and breast care. She leads nature awareness and mindful movement programs in the U.S. National Parks, and has just completed an 18 month, 60+ National Park tour educating her 8 year old son in Native American culture, geology, biology and other life sciences. Their next segment will include the Havasupai culture and the Great Basin, a continuation of the Chaco and Anasazi cultures and the importance of living in harmony and kindness within ourselves and the outer natural environment. Rita teaches mindful movement at the end of the month and maintains a successful physical therapy and integrative wellness practice in the Washington DC area. She is grateful to be a part of the Insight Meditation Community of Washington for the last 15 years. Anna Johns is deeply devoted to her meditation and yoga practice and to helping others along the path. Growing up in India, she watched her father meditate and did sun salutations barefoot. Her studies in yoga and meditation started with Indian Master, Kamal Srinivas (one of 8 living Indian masters) in 2001. Specialized training in the US includes Duke University’s 70-hour Certificate in Therapeutic Yoga for Seniors, (which combines medicine with wisdom), Yin Yoga 65-hour training with Jo Phee, assistant to Yin Yoga founders Paul Grilley and Sarah Powers. Anna has 700+ hours of teacher training and 3000+ hours of teaching experience. Meditation training includes MBSR with IMCW and the Year of Living Mindfully under Jonathan Foust. Anna continues to learn and is currently pursuing Kripalu Center’s 500-hour teacher training and the 2-year Mindfulness Meditation Teacher Certification with Jack Kornfield and Tara Brach. She is part of a Kalyana Mitta (spiritual friendship group) and facilitates two weekly meditation Sanghas. Anna guides Wednesday morning meditation at IMCW. Lynne Weir is a Kripalu trained yoga teacher who owns a private physical therapy practice and teaches yoga classes in Alexandria. On the Potomac you will find her coaching sculling (rowing). She has participated in Insight Meditations evening practices for the past 5 years and is excited to join other yoga teachers in offering a practice for the Monday night Insight group. Daniel Hickman a mind-body educator with over 30 years of experience in spiritual culture. He is the lead of the Silk Road Yoga Sangha and the creator of the Multidisciplinary Yoga Teacher Training. Daniel teaches meditation and adaptive yoga at the Military Advanced Training Center of the Walter Reed National Military Medical Center. He also has taught with the Defense and Veterans Center of Integrative Pain Management, The Howard University Cancer Center/Hospital and Friendship Place/La Casa. He enjoys a tasty coffee in the morning, multiculturalism and traditional rock climbing. He has trained with many monastics. Please bring a yoga mat with you. Thanks! 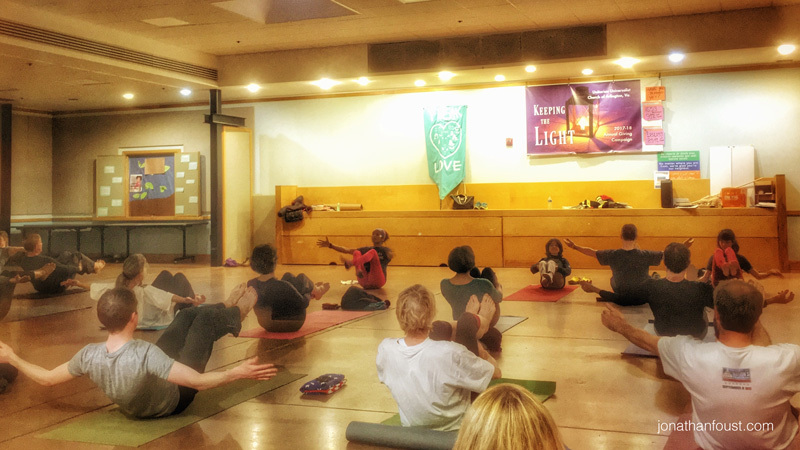 To find out what yoga teacher is leading on any given Monday night, click here. Ray Manyoky and Tara Cassidy host a discussion group after class. This is a wonderful way to reflect and share on your personal practice and connect with like-minded people. The group starts about 8:50 and ends by 9:30. Joining the after-class discussion group is a wonderful way to reflect on your practice and connect with like-minded folks. Parking can be an issue with many groups using the church on Monday nights. You can assume that if a parking space is not clearly marked, it’s a fire lane and not safe. Please know that parking is available on side streets around the church and you won’t be ticketed. 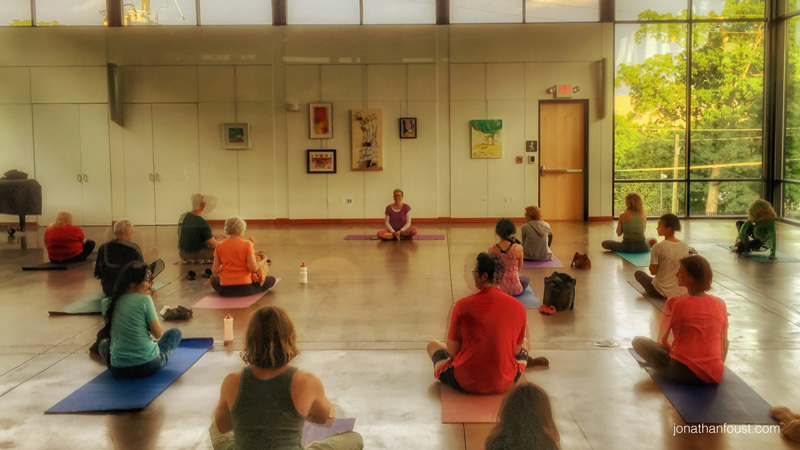 The Unitarian Universalist Church of Arlington, The Insight Meditation Community of Washington, the yoga teacher and class leaders receive no direct compensation for making this evening possible. In the Buddhist tradition, the teachings are considered priceless. Therefore they are offered freely and there is no set fee for the classes. This tradition also encourages cultivating generosity to ourselves and others. Your generosity also ensures that no one will ever be denied access to these teachings and practices. Many thanks to the Unitarian Universalist Church of Arlington for sponsoring our evening gathering for the past ten years. Please feel free to contact us if you have questions about your practice or would like to know more about resources. Jonathan can be reached at jonathanfoust@mac.com and Bob Gayer at treas1@uucava.org.